Heeft u een vraag voor Khaosan Kyoto Theater? Goed gelegen in Het centrum van Kyoto, is het Khaosan Kyoto Theater het ideale vertrekpunt voor uw excursies in Kyoto. Vanaf hier kunnen gasten genieten van eenvoudige toegang tot alles wat de levendige stad te bieden heeft. Dankzij de praktische locatie liggen alle belangrijke trekpleisters in de buurt van het hotel. Simpel gezegd: alle diensten en voorzieningen die u verwacht van Khaosan Tokyo Guest House maken een verblijf zo comfortabel als bij u thuis. Terwijl u verblijft in deze geweldige accommodatie, geniet u van faciliteiten als gratis wi-fi in alle kamers, wi-fi in openbare ruimtes, wasserij, lift, bar. Treed binnen in één van de 6 uitnodigende kamers en ontvlucht de dagelijkse stress met een breed scala aan voorzieningen, zoals draadloos internet (gratis), rookvrije kamers, airconditioning, verwarming, verduisteringsgordijnen. Daarnaast garanderen de talrijke recreatieve mogelijkheden dat u zich tijdens uw verblijf kunt vermaken in het hotel. Het Khaosan Kyoto Theater is een ideale verblijfsplaats voor reizigers die charme, comfort en gemak zoeken in Kyoto. De minimumleeftijd van gasten is: 10 jaar. This is our second time staying with Khaosan Kyoto Theater. The first time we stayed in the deluxe japanese style mix dorm and this time we stayed at an ordinary mix dorm. 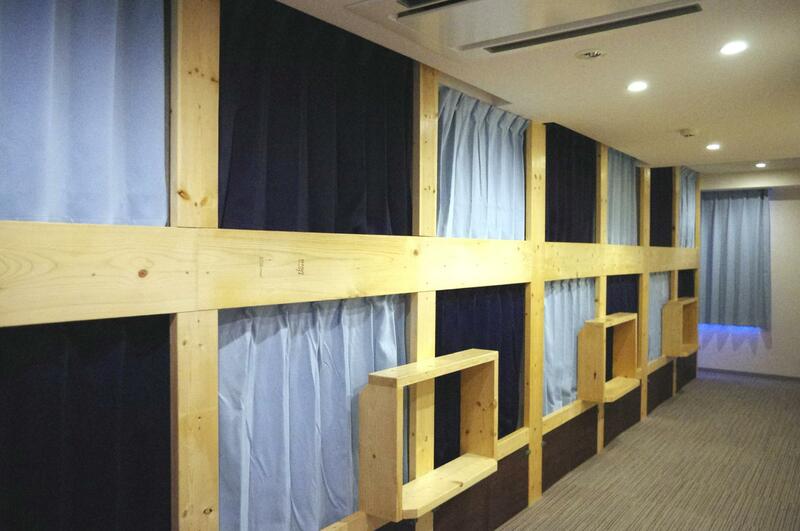 I would much prefer the ordinary mix dorm as you get more space room and less noisy during the night. The facilities and amenities are complete and we get to wash our laundry while chatting with the rest of the dorm mate. Also thanks for helping us sort out the Ta-Q-Bin, we enjoyed our stay and will definitely come back again. Location is excellent. Once you're out, there's plenty of shopping streets and Nishiki market. Staff there are extremely friendly and helpful. Impressed by the amount of ready handmade posters they have for the guests to recommend eating, bars, adventure and so on. Had an enjoyable stay over there for 3 nights. My stay at Khaosan Kyoto Theater was delightful. The staff were very helpful and friendly, the location was strategic, cleanliness was taken care of, and the bar downstairs was an awesome meeting place for other travelers. the kimono bed is simply beautiful and sufficient for a good rest. beats staying in a capsule or bunk bed hostel. the location is very near the shopping streets as well and they have everything in a building; coin laundry, elevator, bar and an awesome team of staffs willing to help. Probably the best hostel I've ever stayed at, and certainly nicer than some hotels I've stayed at. The staff is very welcoming, they have printed directions for everything (which bus/metro to take, suggestions of where to go for meals, they even offer activities), the facilities are sparkling clean (it seemed like they checked them at least 3 or 4 times a day). 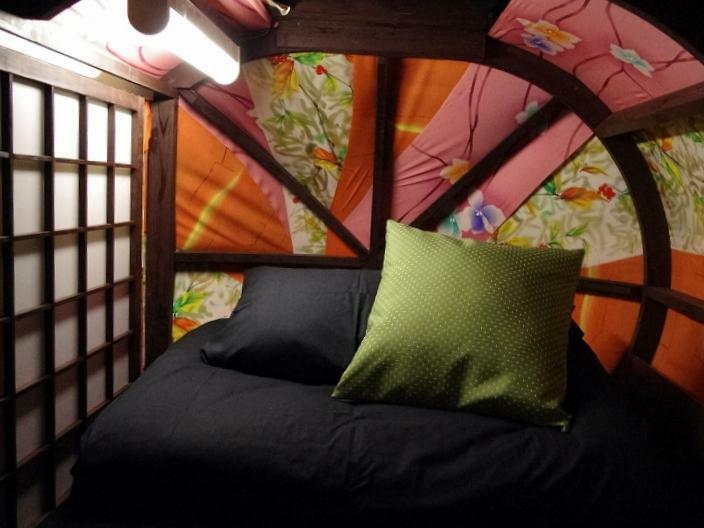 I stayed in the deluxe ladies dorm with the old kimono fabric capsules. The bed was decent, probably too hard for some people, the blanket was very comfy, there was a locked drawer with a shelf and a lamp inside, it was very convenient. The bathroom inside of the room was great, with one toilet and one shower, but there are several other toilets/showers downstairs as well. There's a bar open 2000-23:30 in the basement, I never went, but it sounded like a party. It is a little far from the train station, but within about 10 minutes walk of the metro/bus. It's right in the middle of where you want to be and tons of shopping nearby. I would definitely stay here again!. Khaosan Kyoto Theater is very centrally located and offer quick access to major attractions in Kyoto. The counter staff were very friendly and offer lots of information on places to visit and dine. 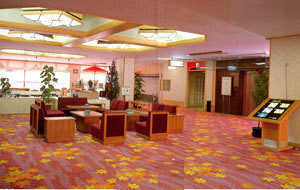 In general, Japan's Guesthouse is of very good standard and Khaosan Kyoto Theater definitely live up to the expectation. Great location, next to lots of good shopping and trains. The common areas are all kept very clean. I enjoyed meeting and talking with people in the kitchen. The staff was very friendly and could speak English. However it took me hours to fall asleep and I would constantly hear the door open and close as people came in and out. It's a heavy metal door too. It got to the point where I got nervous with the anticipation of the door opening. I could also hear heavy footsteps overhead. Also would hear people using their keys to open their lockers cause the are located in the same room. I'm down for 3 nights, but if I have a hard time sleeping tonight I'll go elsewhere tomorrow. Also my pillow smelled like BO and in general my capsule had some weird smells so I kept a bottle of perfume near by. It would have been nice if we had doors with locks instead of curtains. If the insides had some more shelf space. Location of the hostel is quite near to Kyoto Station. It's 2 train stops away. Around the hostel, there are many designers shop, where you are look around at the unique clothing designs by their local designers. It is also quite near Gion area, which is about 15-20 min walking distance. The main road near the hostel has many different buses that will take you to Arashiyama and Higashiyama Jisho-ji. The room is clean and comfortable to stay in. They provide basic toiletries such as shampoo, body foam and hair dryer. 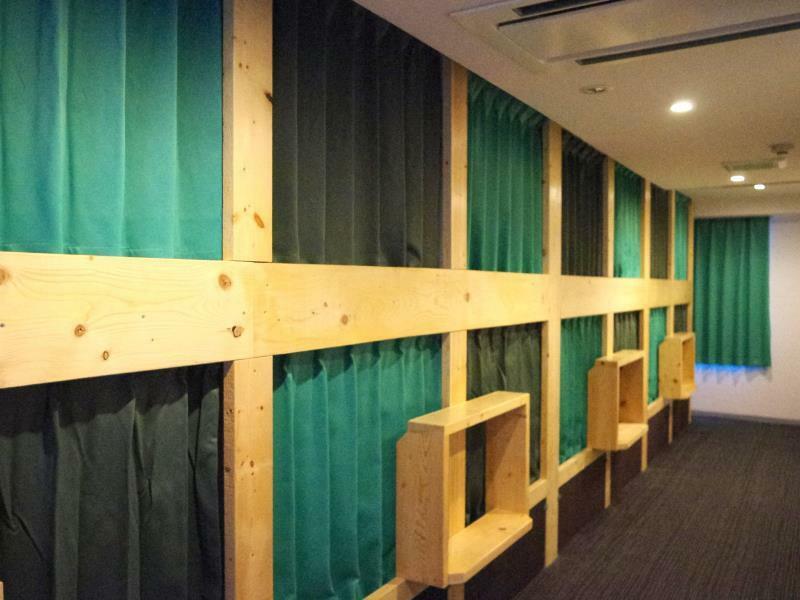 Other than that, it's a great stay at Khaosan Kyoto Theater! Stayed for 6 nights in a female dorm. It's advertised as a 6 bed as is the advert in their lift but it was actually 8 beds. Didn't matter too much though. This hostel is super clean throughout and very comfortable. Has washing and drying facilities with free detergent. Staff are extremely helpful and having worked in 4 star hotels I was very impressed with their service and attentiveness. Kitchen was immaculate. Great location to restaurants and 10 min walk to bus stops and subways. Only small issue was the wifi as it could be quite temperamental and a few people had issues with images loading, particularly annoying for one guest who needed to do some work which involved using images. Other than that I would stay here again and highly recommend this hostel. The Wi-Fi is stable in the living room, and the owner provide detailed map of Kyoto. And this place is very close to the supermarket. (in five minutes) you can buy healthy food there if you are also enjoy cooking. A nice hostel in a good area which is full of shopping and places to eat. 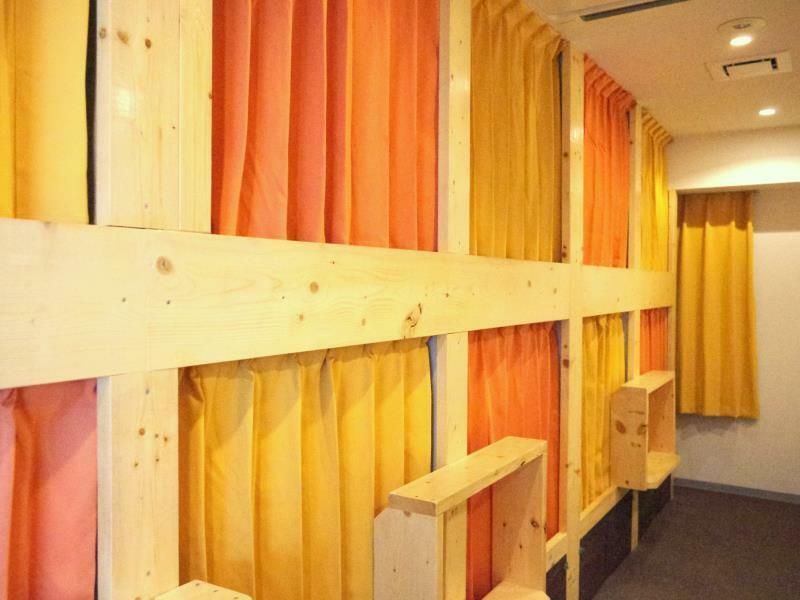 The bunk beds were very creative and provided privacy. There were private reading lights and power sockets in each "nest". The people at the reception were very helpful. They had printed maps and directions for every place you could imagine going. I can to recommend this place to anyone who wants to stay in a hostel. 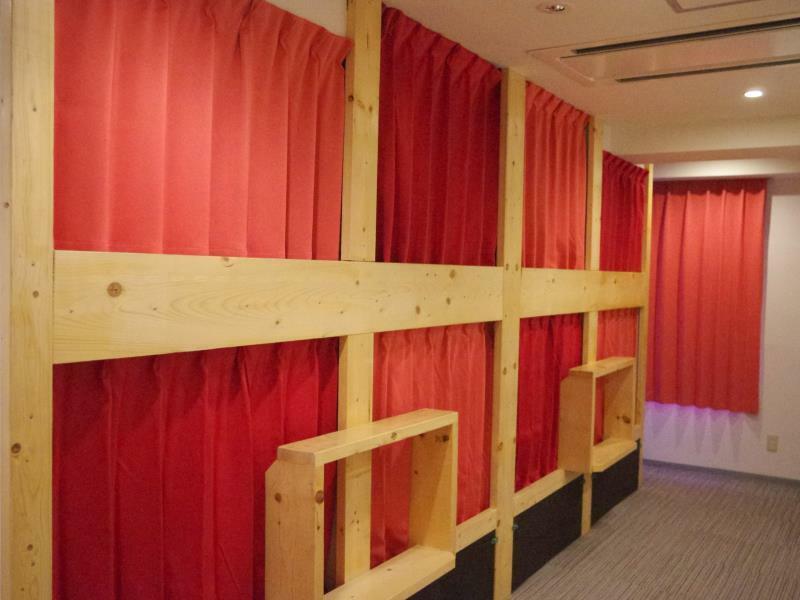 I stayed in one of the deluxe rooms, with the traditional Japanese fabric as 'walls' for the cabin, which was really nice. There were one toilet and shower specifically for our room (8 people total) with lots of products available, and we had also access to other toilets and showers if it was busy. Staff was very accommodating. 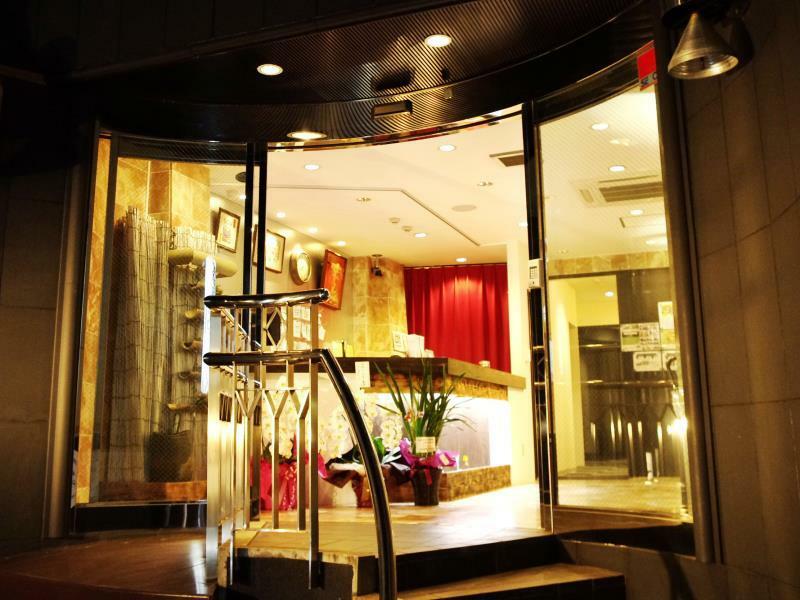 Hostel is located conveniently near to Nishiki Market, Daimaru and Takashimaya. Short walk to bus stop and subway. Easy to get to places such as Gion, Kiyozumi-dera, Fushimi-Inari and Arashimaya. Staff are very friendly and courteous; they'll do anything they can to provide assistance. Bathrooms are spacious and clean. Bed is comfortable. If at Arashimaya, make sure to eat at Anju; great place for beef bowl. Do make a trip down to Uji as well where you can have some delectable matcha treats and cha soba at Nakamura Tonkichi Honten. 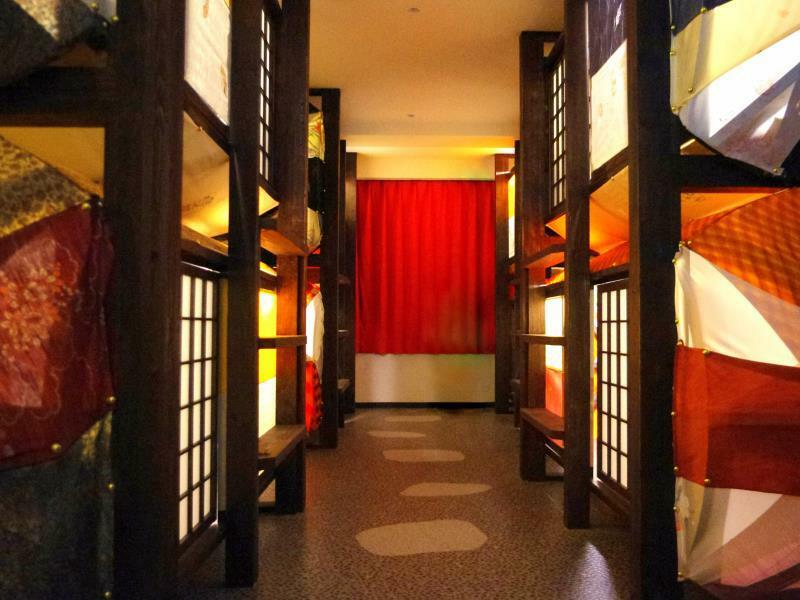 This is probably the best hostel I've stayed in Kyoto. It have convenient location, clean rooms and a clean washroom/toilet/bathroom. Each capsule is large enough to fit one person comfortably. The staffs are friendly and helpful. I would definitely come back to this hotel. very good location around the walking street, it has a bar downstairs, but not noisy. Staff is handsome :D, and could speak Chinese very well. The bed is special but good enough for 1 night staying. Go out of the street , there's bus to train station. I love staying there! It was a wonderful experience for us staying there for couple of days while we were in Kyoto. The price is reasonable, also, the staffs are really helpful! Thank you, Khaosan Kyoto Theater! I will definitely visit you again! Stayed in Khaosan ninja last year in tokyo so was delighted they had another 2 branches in Kyoto. Cleanliness was the standard in both places, but kyoto branch location and other performance was not that good compared my experience in tokyo. Location was not good, either kyoto was like this or just this hotel was actually quite far away from the nearest train station. normal walking was ok but lugging a luggage was a different story. Bed space, took a kimono bed as the pics looks good, actual bed was quite a letdown, just some cloth covering a bear cave as I would liked to call it, Tokyo ninja branch was similar but was wood covered with the option to lock the cabin sliding door, Kyoto ones just had a drawer inside you could lock, no locker also for bigger items unlike tokyo branch. Staff performance - no doubt polite and efficient, less warm and friendly compared to Tokyo, sorry I keep comparing with tokyo branch but it was the only other backpacking hostel i stayed under Khaosan group. Overall sad to say I would not recommend this hostel to other traveler as there seems to be better more location friendly hostel in kyoto.